Paste your favorite photos in this high-quality and unique leather cover scrapbook and keep your best memories forever. 1.You could use it as a wedding album.Embossed heart-shaped cover stands for love between couples.Paste your photos in this album and keep them well forever.When you open it,you and your half could remember these sweet moments and show them to your friends and your children in the future. 2.You could use it as baby photo album.This cute scrapbook could hold your baby's photos.When baby grows up,you could show it to him or her,these can be good and precious memories. 3.You could use it as gifts for family members, friends,or classmates,also as a birthday gift, Valentine's Day, Mother's Day, Christmas Gift and many other special occasions. 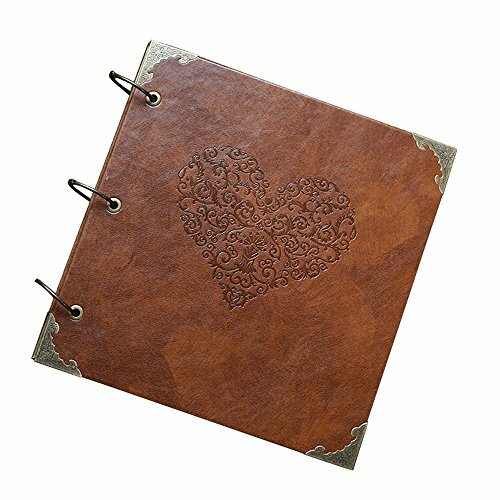 The brass three ring binder allows to easily remove or add new pages to create a wedding memory book or baby photo album that suits your needs. PREMIUM QUALITY---Leather cover album size 10.8"x12.5" comes with 25 sheets/50 pages of thick brown blank craft paper.Sturdy and durable for years. VARIOUS FUNCTIONS---Can be used as anniversary album,wedding guest book,baby photo album and journal scrapbook.Very fashionable and fancy way to store and show your photos. MORE OCCASIONS---Fantastic for weddings,parties,graduations,guestbook,banquet,reception,anniversaries,baby photos,memos,memories,drafts,DIY,or other applications.It's up to you. PERFECT GIFT---Nice gift for your families, friends ,classmates or soul mate.Used as a birthday gift, Valentine's Day, Mother's Day, Thanksgiving day,Christmas Gift and many other special occasions. EASY USE---Three ring bound for handy page turning and paper arrangement.Precious memories are buckled well. If you have any questions about this product by xdobo, contact us by completing and submitting the form below. If you are looking for a specif part number, please include it with your message.